Today I am going to the theatre with some friends and family to see Priscilla Queen of the desert. It’s a day date. The show is from 2.30pm and will be followed by dinner with the girls at 5pm. I wanted something comfy as I’m getting the train into town and have to walk up from the train station but I also wanted an outfit that was semi-dressy for our meal. I settled on this beauty. I bought it from urban outfitters in the Christmas sale. 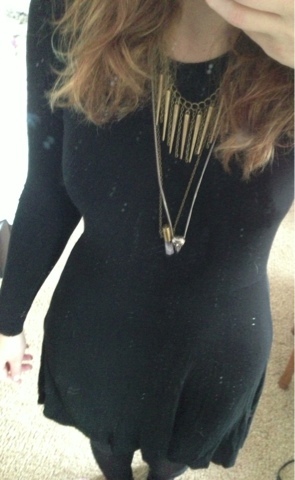 It was only £10 and I thought a basic black jersey dress is always a winner as you can dress it up or down. I wore it with tights and my office night hawk boots. As the dress is quite plain I have gone completely OTT with the jewellery to glam it up a bit. I have a pair of earrings, 3 necklaces and 2 rings. Now I never wear jewellery so this is a record! Although Nick made a face when I jangled my way down the stairs. I like the fact my neck is weighed down with my pretties. I feel like an Egyptian queen or Miss Trewlawny from Harry Potter. What you think? Too much?